AMMAN — Chairman of the Joint Chiefs of Staff Lt. Gen. Mahmoud Freihat on Thursday presided over the closing session of the Jordanian-American Military Cooperation Committee meetings. 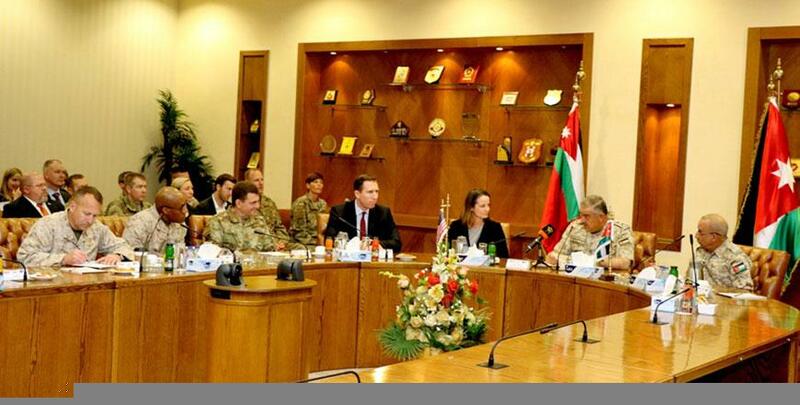 The closing session was held at the Jordan Armed Forces-Arab Army (JAF) headquarters, and was attended by Kathryn Wheelbarger, the US’ acting assistant secretary of defence for international security affairs, the Jordan News Agency, Petra, reported. Freihat thanked the US government for its continuous support of Jordan, and stressed the “depth of strategic and fraternal relations that the two countries share”. He added that the Jordanian and US militaries would continue cooperating in pursuit of regional and international peace and security, Petra reported. “Jordan holds a special place in the eyes of the US, and the continuation of cooperation between the two countries is a strategic priority for the US,” Wheelbarger said. The committee’s meetings, held over a period of two days, aimed at enhancing the frameworks of cooperation, collective efforts and the exchange of military expertise between the two countries. They also tackled potential ways to bolster US-military support to the JAF. The closing session was also attended by a number of high-ranking Jordanian and US military officials.